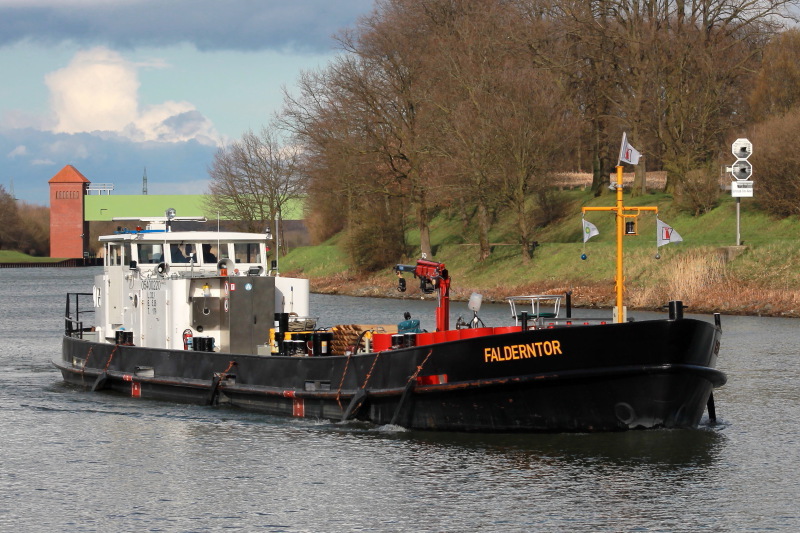 One of the resident bunkering tankers seen on Dortmund - Ems Canal at Datteln/Germany at Canal Kilometer 21. Note : Visible in the background is a safety construction (Sicherheitstor) which can be lowered to the canal's bottom to prevent massive flooding of adjacent areas in case of a breached dam. These constructions are built in certain intervals on canals, for example between the locks at Münster and Hannover are nine of these safety constructions over a distance of 211 kilometres. Moin Volker, you're welcome, these safety constructions are really necessary. There have been a couple of dam breaches along inland canals in Germany in the past with quite dramatic consequences. I have re-uploaded this picture for a technical reason and have included the info about this safety construction in the description. Sorry for the late reply, I was absent for a couple of days. Moin Hans.Thank you for the description about the safety constructions.All the best to you my friend and cheers,Volker.